A passion to please God should be the focus of every Christian’s life. As we please Him, we bear fruit and shine as lights in this generation. Scores of people became Christians during the early days of the church because they saw that Christians lived differently from those around them. We can see the same thing today, the church and the culture experiencing the revival we need so desperately, as believers like you and I live as Christ calls us to live and encourage others how to do the same. Thanks to the support of friends like you, Ligonier Ministries has been strengthened to help the church teach the biblical truth that while we are declared righteous by faith in Christ alone, true saving faith is never alone. Faith that doesn’t bear fruit is no faith at all. Because we all have trouble understanding the biblical view of spiritual growth, I wrote a book twenty-five years ago titled Pleasing God. In this work, I explore the basic principles of sanctification and our battle against the world, the flesh, and the devil. The Christian’s aim is to live in the presence of God, under the authority of God, to the honor and glory of God. This week we are airing the teaching series based on this book on Renewing Your Mind. 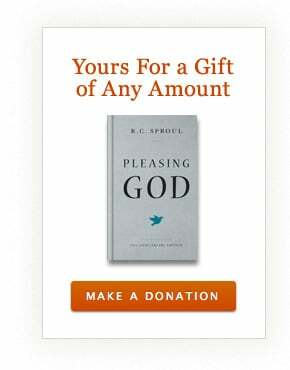 We are offering a special twenty-fifth-anniversary edition of the book Pleasing God as a thank you for your gift of any amount to Ligonier’s Bible teaching ministry. You can contribute to our work via our secure website. As we please God, our impact on the world around us will grow, and Christ will be glorified. Will you help us to teach others how to strive for godliness? Note: Offer expires 11/30/13. Please allow up to 6 weeks for delivery after your gift is processed. Contributions are tax-deductible as allowed by law. For federal income tax purposes, the deductible portion of your charitable contribution is limited to the excess of the money contributed over the value of the goods provided. Our good faith estimate of the value of these individual resources will not exceed $7. Offer valid in U.S. and Canada only. Thank you for your support.